The smart solution for your cooking and grocery shopping. Recipes are easily added by typing them in, pasting them from the clipboard, or importing directly from the internet: no formatting is necessary. The wizard interprets the recipes, links them to the database of grocery items or to other recipes and yields an accurate nutritional analysis without user intervention. You organize your recipes by categories and in cookbooks that you can share with the free Shop’NCook Reader software. A powerful scaling tool lets you scale the ingredients and the text of your recipes, make automatic ingredient substitutions and unit conversions. The ingredients of the recipes are converted to your preferred shopping units and added to a collating grocery list with a click. 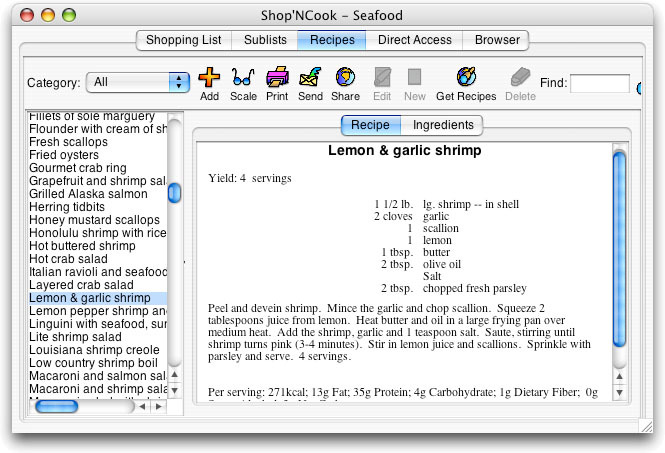 Contrary to most cooking software, grocery lists can also be created by directly selecting items of the database, adding from sublists or just typing in new items. Other features: customisable database of 2000 grocery items with nutritional data for more than 40 nutrients; nutrition scripts to control the display of nutritional information and compute custom nutritional formulas; e-mail tool to send recipes and shopping lists; direct access to an online recipe database where Shop’NCook users share their recipes. Cookbook+Calendar is a scheduler, that enables to plan a menu, a diet or a dinner party, and to store recipes. 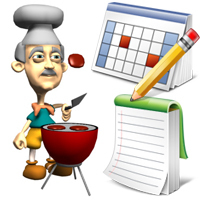 A handy tool for those who want to manage meal planning calendar quickly and easily, it will be essential for grocery and restaurant managers, for sportsmen and those who keep to a diet, and for all those who enjoy cooking. With its intuitive interface, Cookbook+Calendar is designed to be a recipe database and to help with planning a menu or a diet. The software supports most of the formats, including HTML, which makes saving recipes extremely easy. Just save it as is, drag and drop it directly into the appropriate time slot – and it is in the database! Flexible options allow customizing the calendar and copying events or changing the date. It also supports adding pictures, comments to the recipe and information for glossaries. Cookbook+Calendar will provide you with the list of holidays, and it will remind you when you should start cooking dinner. What’s more, with it you can create shopping list reminders. The program features search by recipe name and also by main ingredients, which means that it is always ready to suggest you a recipe for the products available in the fridge. Cookbook+Calendar supports exporting recipes of any format and saving them on USB, so you can easily share your favorite recipes with your friends and mates. The program can serve as a home accountant: it lets you calculate and save the approximate price of the dish, and then provides you with the statistics for any period of time; thus, with its help you can track all the food expenses. Cookbook+Calendar is a must-have for those who want to be in full control of the meal planning calendar. Interested in seeing the program code that makes The Recipe Processor For Windows work? Do you want to modify or add your own features to The Recipe Processor? The source code for The Recipe Processor For Windows 2.1 is now available for sale. What is source code? Source code is made up of human readable programming commands to perform a given task. 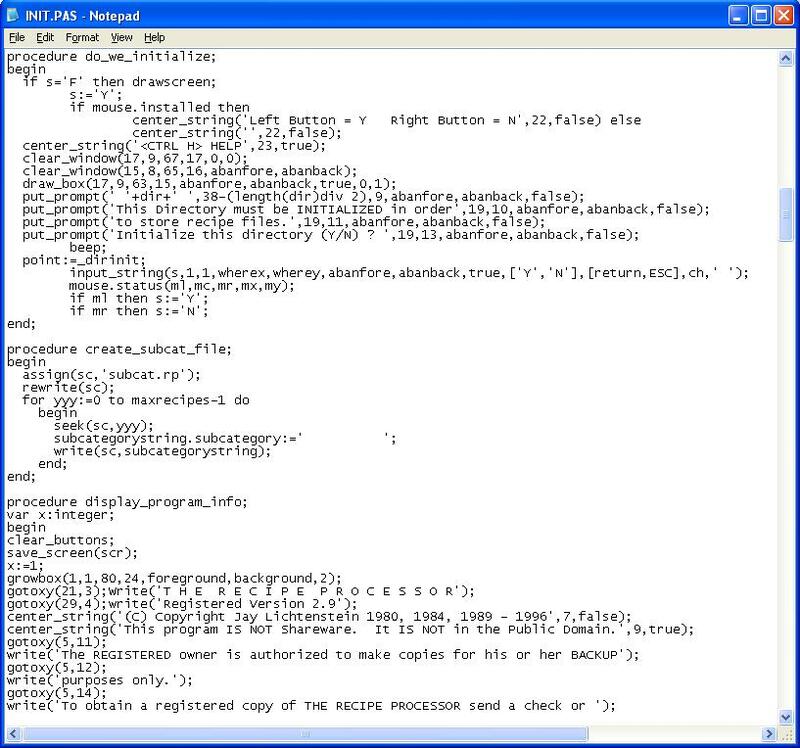 In this case, the source code is the human readable program commands that make up The Recipe Processor. The computer cannot understand source code, so a computer program called a compiler is used to convert the human readable commands to an executable file that the computer can understand and run. Having the source code allows you to modify the program, add features, and gain an understanding of how the program operates. Of course, you must be a proficient programmer to modify the source code. Wouldn’t it be nice to have the source code for Microsoft Word or Excel? Source code for commercial applications is hardly ever made available to the public. The Recipe Processor For Windows source code is now available for anyone who is interested in tinkering with it. This package contains all of the Visual Basic source files and bitmaps to compile the program. You will need Microsoft’s Visual Basic 3.0 to view and compile the program.. If you have a later version of Visual Basic, you may have to modify the code in order for it to compile. This is a Windows program, and it will run on Windows 95, 98, ME, XP, and 2000. If you are using Windows Vista, you will need to install and run Microsoft’s Virtual PC with one of the above operating systems. There is no documentation for the code other then the code itself. There is no support for modifying the code. The code is guaranteed to compile with Visual Basic 3.0 only. New in version 8.3 – Cooking Timers! Have independent namable timers for your cooking needs! The Recipe Processor can offer Healthy Ingredient Suggestions! Have the program suggest healthier ingredients from the user expandable Healthy Ingredient Database. 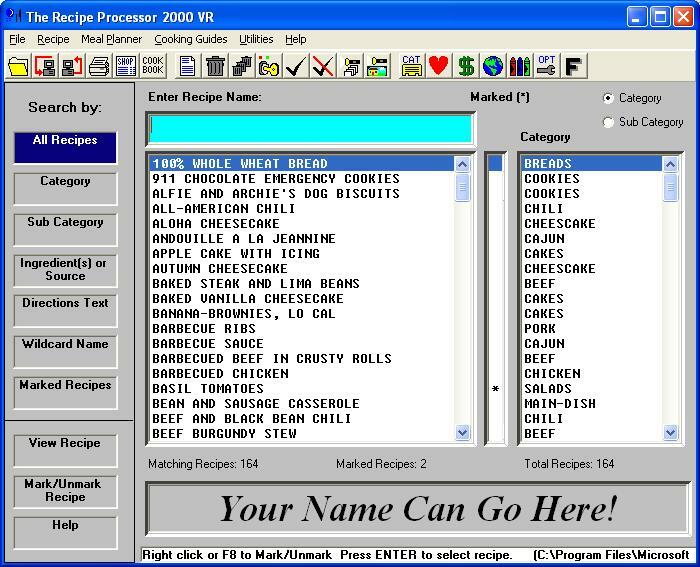 The Recipe Processor 2000 VR is a feature full recipe management program. Enter and manage individual recipes. Search through recipes by name, category, sub category, ingredient, directions, or wildcard name. Adjust serving size and ingredient amounts instantly. Convert from one measure to another. Print either of two available shopping lists. Display two recipes side by side for comparison. Calculate calories, cholesterol, sodium, fat, protein, fiber, carbs and recipe cost in real time! Features quick entry that will save time and keystrokes when entering recipes. Has an integrated spelling checker and word definition dictionary (over 1,100 cooking definitions included). Customize recipe printouts to get a personal touch. The Meal Planner allows for planning meals daily or weekly while tracking nutrition by meal and by day. Network enabled for the professional user! Add sound and video to each recipe for multi-media recipes! Add your own vocal instructions or endearments to your recipes! Use your favorite software and hardware to create AVI, MPG, and WAV media files, and then attach them to your recipes. Just imagine your children watching and listening to Grandma prepare her favorite recipe! What a great way to preserve family history! Import recipes from Meal-Master, Master Cook II, and Recipe Box 5.5. New Unformatted Import utility lets you import recipes from any Web page or ASCII file, with hardly any keystrokes! Advanced features allow you to scan recipes directly from books and magazines, attach pictures and media (wav, avi, mpg) files to each recipe. Comes with 12 cooking guides, and you can create your own custom cooking guides with multi-media for the ultimate cooking guide tutorials. Import cooking guides created by other users of RP2000! There are over a dozen custom features to specify the way that RP2000 looks and works! Context sensitive help is available. Interested in seeing the program code that makes The Recipe Processor work? Do you want to modify or add your own features to The Recipe Processor? The source code for The Recipe Processor DOS is now available for sale. What is source code? Source code is made up of human readable programming commands to perform a given task. In this case, the source code is the human readable program commands that make up The Recipe Processor. The computer cannot understand source code, so a computer program called a compiler is used to convert the human readable commands to an executable file that the computer can understand and run. Having the source code allows you to modify the program, add features, and gain an understanding of how the program operates. Of course, you must be a proficient programmer to modify the source code. Wouldn’t it be nice to have the source code for Microsoft Word or Excel? Source code for commercial applications is hardly ever made available to the public. The Recipe Processor source code is now available for anyone who is interested in tinkering with it. This package contains all of the Pascal source files needed to compile the program. You will need Borland’s Turbo Pascal compiler version 5.5. If you have any other version of the Turbo Pascal Compiler, you may have to modify the code to make it compile. If you do not have a compiler, but wish to view the source code, you can use NOTEPAD to view the source files. While this is a DOS program, it will run on Windows 95, 98, ME, XP, and 2000 in a DOS window. If you are using Windows Vista, you will need to install and run Microsoft’s Virtual PC with one of the above operating systems. The Turbo Pascal compiler version 5.5 can be downloaded from the following page. The Recipe Processor is in no way associated with this page or the download. There is absolutely NO SUPPORT for the source code. It is sold as is. December 14, 2014 Food & Beverage, Home & Education, SoftwarePrimaSoft PC, Inc. Recipe Organizer Deluxe is a complete program that allows recipe collectors, and chiefs to organize, catalog, and manage their recipe collections on their PCs. Organizer is intuitive and easy to use for the beginner, at the same moment feature-rich and powerful enough to satisfy the most advanced users. Benefits: Master your data with user-friendly features. Arrange information any way you want to view it. Find and retrieve information quickly with flexible search, powerful filter, and multilevel sort functions. Report Wizard, Label Wizard, HTML Generator Wizard let you create quality, professionally looking documents, Web pages, inventory reports, labels, envelopes with color and graphics. Other features: Custom data fields. Integrated with browser and email program. Support for the direct entries from TWAIN compliant devices (scanners, digital cameras, and other image capturing devices). Browser View Page: You can display record (text and graphic) in the form of the WEB page. Wine Organizer Deluxe is a complete program that allows wine collectors, hobbyists, wine clubs, and cellar’s owners to organize, catalog, and manage their wine collections on their PCs. Organizer is intuitive and easy to use for the beginner, at the same moment feature-rich and powerful enough to satisfy the most advanced users. Benefits: Master your data with user-friendly features. Arrange information any way you want to view it. Find and retrieve information quickly with flexible search, powerful filter, and multilevel sort functions. Report Wizard, Label Wizard, HTML Generator Wizard let you create quality, professionally looking documents, Web pages, inventory reports, labels, envelopes with color and graphics. Other features: Custom data fields. Integrated with browser and email program. Support for the direct entries from TWAIN compliant devices (scanners, digital cameras, and other image capturing devices). Browser View Page: You can display record (text and graphic) in the form of the WEB page. Recipe Organizer’s intuitive interface and ready-to-use templates make it easy to set up and use. Recipe Organizer Basic: organize and maintain all your recipes in the most common format: recipe name, course type, cuisine, main ingredient, yield, preparation time, ingredients, directions, picture…. Recipe Organizer Detailed: organize and maintain detailed information about all your recipes: recipe name, course type, cuisine, main ingredient, cooking method, yield, preparation time, wine, source, keywords, ingredients, directions, picture…. Web Cooking Resources: organize Web Cooking resources (the best cooking and recipe resources included). Ready-to-use templates: there are other solutions that will enable you to be productive and effective at home or work immediately. For the power user, Recipe Organizer affords the simplicity of wizards that make it easy to set up and use the recipe database organizers that you create. SAVE UP TO 70% GO TO THE NEXT PAGE !! Wine Organizer Deluxe is a Windows software that allows wine collectors, hobbyists, wine clubs, and cellar’s owners to organize, catalog, and manage their wine collections on their PCs. Organizer is intuitive and easy to use for the beginner, at the same moment feature-rich and powerful enough to satisfy the most advanced users. For the cook in the family this program should be a must. It contains the following functions: Recipe function – comes with over 340 family favorite recipes, you can add thousands of your own. Menu planner – helps you plan out your daily menus. Finally, the Shopping List Maker – helps in preparing your shopping list. Select items from the Quick list or from recipes themselves or enter your own item.